A donation to the Friends is a donation to help the library continue to move forward in innovation and technology to better serve the community. The Friends of TSCPL are very fortunate to receive donations—both financial and materials—from members, the general public, libraries, businesses and other organizations. Materials donated are used for the inventory for the Book Sale, Chandler Booktique and Online Sales. The following is a guide of items we would like to have donated as well as what we are unable to use. All donations should be in good condition, clean, dry and mold-free. The Friends do not recycle books that are in unusable condition or that aren’t likely to re-sell. 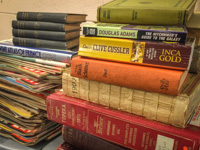 Any – Nonfiction (examples: textbooks, instructional, repair & owner manuals), art, biography, children’s, crafts, literature, cooking, westerns,hHistory, rare & collectibles (including childrens), mystery, fiction, audiobooks and science fiction. 2000 and newer – aging, fantasy, paperback, politics, religion, religious fiction, science, true crime. Classics in these genres can be donated. The condition of the materials received is very important. For the health and safety of our customers, volunteers and staff we are unable to use items that have been damaged. This includes materials that have been wet, moldy, buggy, have a strong odor, chewed, burnt or dirty. Please recycle these items yourself. 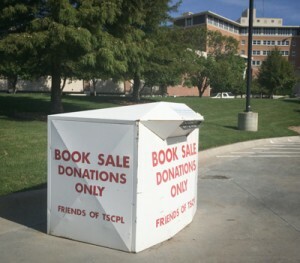 All donations to the Friends of TSCPL are tax deductible. The person receiving your donation should ask if you would like a letter acknowledging your donation. You will be given a green slip to fill out so a letter can be sent to you. The Friends do not assign value to your donation. If you need an itemized list, you will need to make a list and attach it to the letter you receive from us. View Friends of TSCPL IRS Form 990. If you have just a few items to donate, you can take them to the Chandler Booktique in the library. Also there is a white donation box inside the drive to the dock area (west side of library). View location map. This donation box is best used if you have a few items and do not want a letter for your taxes. If you have a box or more, you may take your donation to the library’s loading dock area. If the dock doors are not open, there is a white doorbell up by the back door. Please ring the doorbell and someone will assist you. You could call ahead at 580-4400 or 580-4445 to make sure someone is available to meet you. The best times to bring donations to the dock are from 7:30 a.m.–4 p.m., Monday through Friday. Learn more on how to donate: How to Donate Books in 3 Easy Steps.